If you're a fan of robotics and overkill, this vid is for you. If you're not one to care for the finer details, skip forward to the 5 min mark and marvel at this beast of a rig.. 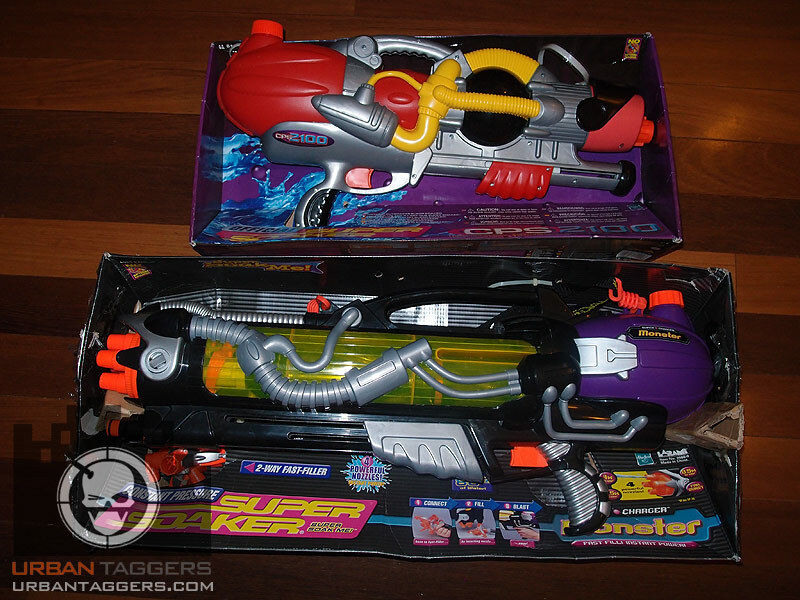 The Super Soaker Monster was released in 2001 as a smaller, more practical version of their Monster series- the previous being the X and XL. Sure it’s smaller and more practical compared to its bigger brothers, but it’s like saying a baby elephant is pint sized; it’s just not! It’s still quite a sizable unit that can still dominate any water fight; alas these blasters aren’t available any more and they’re pretty hard to come by, unless you’re lucky- which we were:) We had a rare opportunity to pick up a never been used Monster for our test unit given it was 10 years old but still in original packaging; it was to say the least.. impressive..
Old school Constant Pressure System (CPS) Super Soakers are a precious find; if you can find one in decent condition you'll be able to pretty much outclass any current water blaster available in stores today. The thing is, finding them is never easy and tends to cost a mint- eBay sellers do tend to be opportunists which can mean jacking the price up to in the hundreds and beyond, not to mention the ridiculously high shipping charges that go with it for international postage. It's a fair amount to pay for a blaster that you KNOW has been scuffed, wet and thrown around in the sun. So you can imagine my amazement when I spotted an ad in the local paper for some "vintage toys still in boxes' and found these two pieces.. just as advertised- NIB. The boxes were a little crumpled, and there were a few scuff marks on the blasters as well as a fair amount of dust, but they were still unopened and never been used. The lady used to own a toy store many years ago and these were just some units that ended up never selling and collecting dust in her spare room. 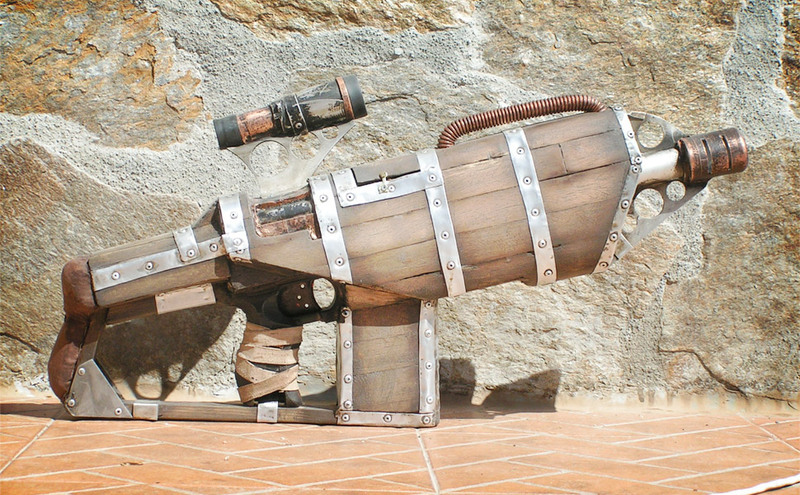 UK props designer "The Model + Props Guy" Does some seriously insane work; he was responsible for the wooden Big Daddy blaster/Barricade RV-10 mod we listed below, and now we're gobsmacked by his Warhammer take on the Lanard Shell Shock X-6. Check out the site below, or more images of this beast of a mod after the jump. 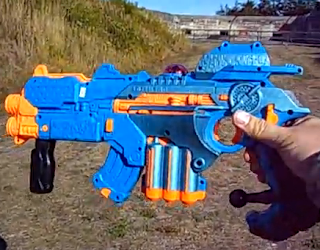 Arts + Crafts: It's a Barricade RV-10.. but not as we know it..
Another blaster that Lanard Toys have released in their clear series is their ball-projectile X-Stream Air Tri-Blaster. As with all of the X-Stream Air clear blasters, they sort of popped out of nowhere and aren't even listed on the Lanard website so it was just one of those "well that's interesting" moments that just got me curious and after walking past the shelves of Myer several times this past few weeks, I finally decided to pick one up. 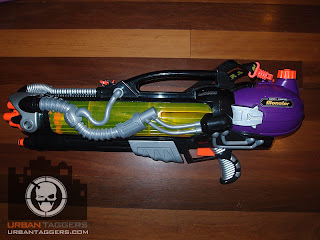 I have to say, this is a first for me as I have NEVER bought a ball blaster before; I was tempted a few times to pick up a Nerf Reactor but even as a completionist collector I was still able to ignore it due to the crap performance and lack of trigger. This one from Lanard however finally reeled me in- a rotating triple barrel 9 shooter with a funky cocking mechanism and a trigger? ooooh, lemme see..
Rant: More? You want some MORE?! Today's announcement of the "new exclusive Nerf blaster" was definitely received pretty poorly on the whole by fans, who were obviously all expecting something.. well bigger and better than another Barricade RV-10 repaint. 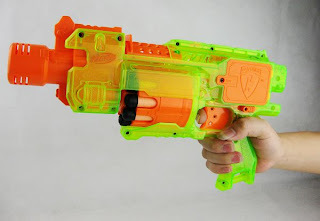 It's interesting how the benchmark Nerf has set is something that even they are struggling to deliver on; the delivery of four new blasters in the shape of the new Vortex line has not even been a month old and already people are screaming for "what's next?".. whoah. Ease down turbo!!! I keep having Blogger issues, but finally have been able to get this post up. 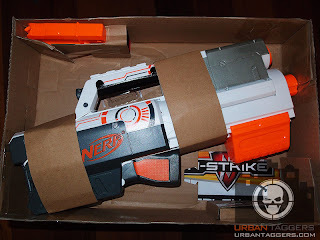 Nerf keep pushing the Barricade RV-10 (maybe it cost a mint in R+D and they need to recover costs! :P) regardless of the fact being a flywheel blaster it's got a boot load of critics... except for a select few of close peeps I know with modded ones who stand by them as awesome:) Well.. the Barricade is now looking to come out in the "I dunno how I feel about lime green but it's still kinda cool" Sonic Series translucent finish. Not much else I can really say other than.. coming soon! 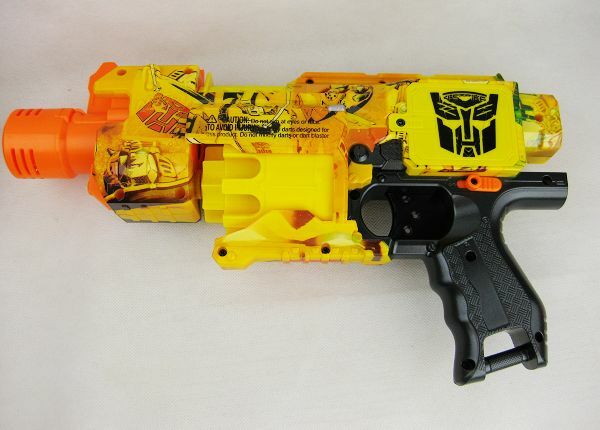 In perhaps one of the more anti-climatic announcements of the year, Nerf have officially released a Bumblebee repaint of the Barricade RV-10 to coincide with the New York Comic-Con (October 13-16 2011) in similar fashion to the Optimus Prime repaint for the San-Diego Comic-Con earlier this year. 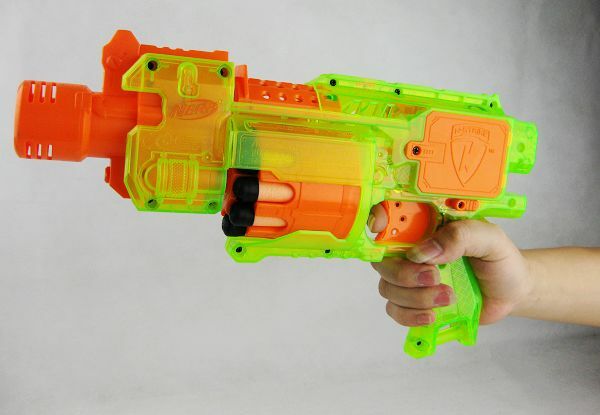 Nerf released news of a" new exclusive Nerf blaster" yesterday on their Facebook page which although came out of nowhere, had us all speculating over what it could be over the past day; it's always ballsy to deliberately generate hype in this space, as more often than not fans expectations are VERY high. From our take though, it's interesting times ahead. What I personally find cool about it all is it's the attempt to generate a whole new market for Nerf- the comic collector. Using the a Nerf blaster as a canvas for art and making them 'exclusive' (or at least limited runs) means it's less about using them in wars and more about collecting and storing them with comic collectibles; we're talking about marketing to a different breed of toy collector. The choice of using the Barricade again makes you wonder if they'll keep using it as a canvas for future limited Comic-Con releases, or if the Decepticons/other franchises will have a different blaster etc etc. SG Nerf: Nerf N-Strike 18-dart Drum Magazine Set! 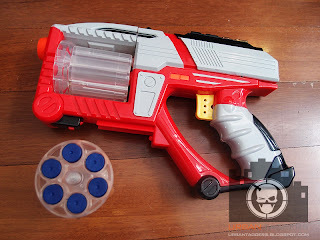 A great example of "fans ask, Nerf listens";) Spotted on premier Nerf blog SGNerf, the 18round drum normally accompanying the Alpha Trooper CS-18 looks to soon be available on its own. Not sure WHEN on availability yet, but hopefully, it's comin! UPDATE: For our US folks, we hear from one of our readers it's confirmed "Kmart Pocatello ID 83201 $14.99 6 in stock spotted yesterday"- Thanks Jesse! Tactical Tag: LTX DMR Complete! Phoenix LTX Lazer Tag blaster in a Nerf Stampede ECS shell. Hot. Rumours: Bumblebee Barricade RV10 in the works? Tactical Tag: New LTX Accessories! If you're a Phoenix LTX fan you'll have known a few years ago there were plans to develop additional attachments (such as the much coveted Rapid Fire unit above), but it never happened and alas we were all left begging. What they DID provide many of us who bought the blasters brand new is a somewhat useless TV game attachment- I say useless mainly due to 1) most people at this point owned 100hz Flatscreen, Plasma or LCD televisions which it didn't work on, and 2) the game was crap. I am a tad bummed that my gf (admittedly with my blessing) threw these out given I thought I'd never need them ever.. until now. 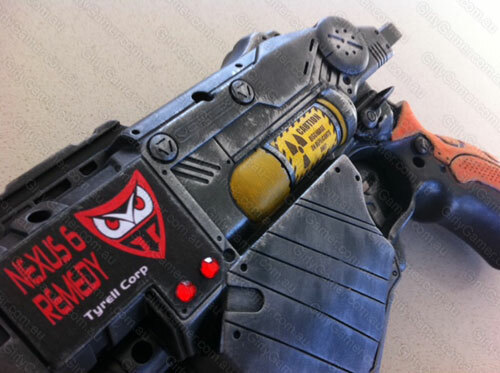 "I am completing the design of a PCB that can be easily soldered together by hobbyists and will convert the LTX TV Game into a new weapon barrel. Initially there will be two models, RapidBlast (same function as the RapidFire) and SniperShot (self explanatory). " That's AWESOME. If I still had my TV game attachments:( That being said,I'm not really a hobbiest- more of a goober at this sorta thing; so I'm also pleased to learn they will be producing ready to play attachments with the same capabilities, eventually from these good people at 1 Source Laser Tag. 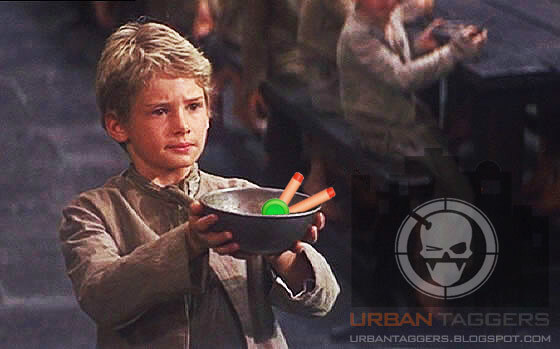 Nerf Dart Tag: Possible 10 shot blaster? I'm sure we'll find out more over the following months, but my initial responses is the blaster looks kinda ugly. 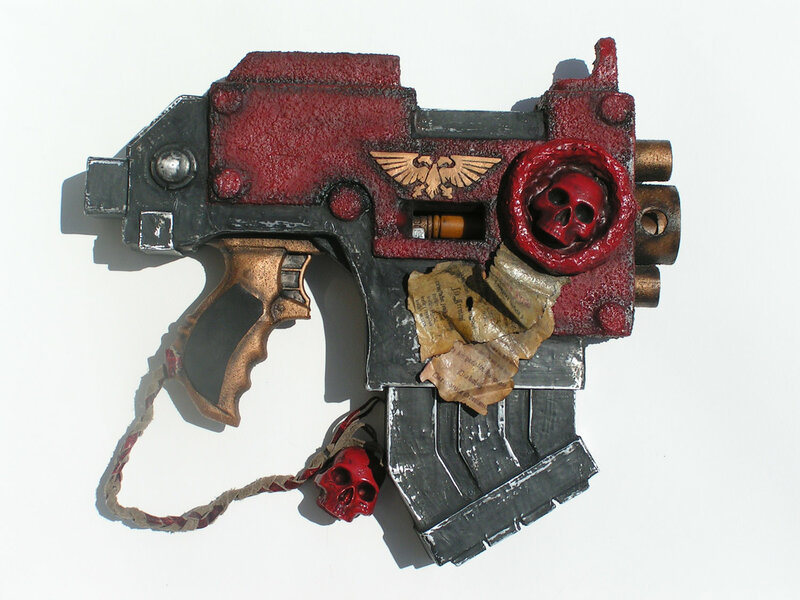 While the Swarmfire seemed to make lots of sense in design and functionality, this looks sort of rushed and an ergonomic fail as a pistol style blaster given the size and probably weight. Or perhaps they're going after a more "submachine gun" plan for it. 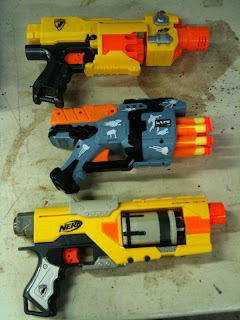 Orange Modworks is definitely making waves in Nerf land, bringing the joys of modding to the masses. 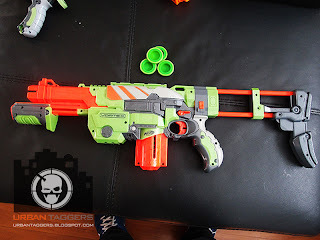 What started off as a kit for the tried and true Recon, has now grown to kits for the Alpha Trooper, Longstrike and Raider but there's always been that underlying thought on everyone's mind.. "What about the almighty Longshot?" Check out their site if you haven't already; no doubt when these kits are released they'll sell out pretty quickly so here's the heads up that they're coming.. watch this space! As you know modding isn't our thing, but credit where credit is due, this is pretty damn cool. 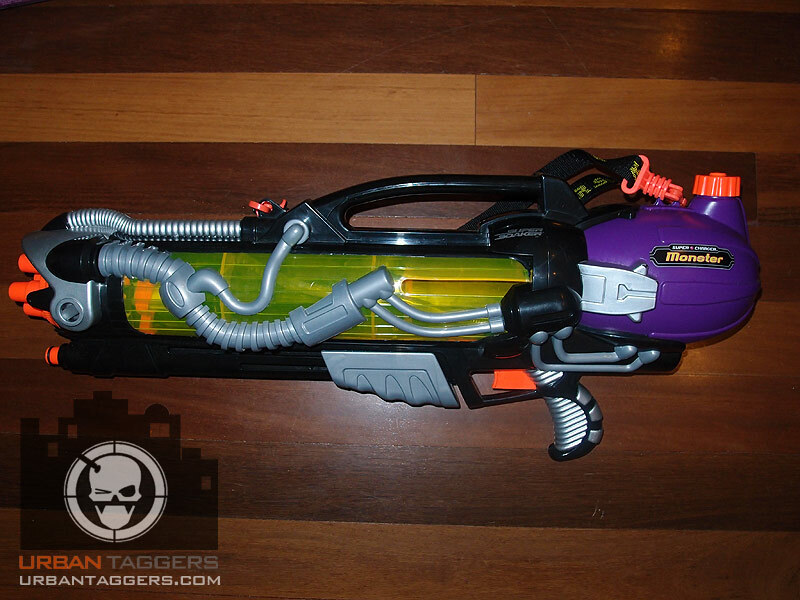 From Makeitgo, the same dude who made the very cool 'Octoshot' from a Lanard Quadshot rifle is a Frankenstein-esque mod of a Nerf Supermax 1500 crossed with a Dart Tag Hyperfire. It looks awesome but more importantly.. how about dem ranges eh? More on Makeitgo's YouTube channel. 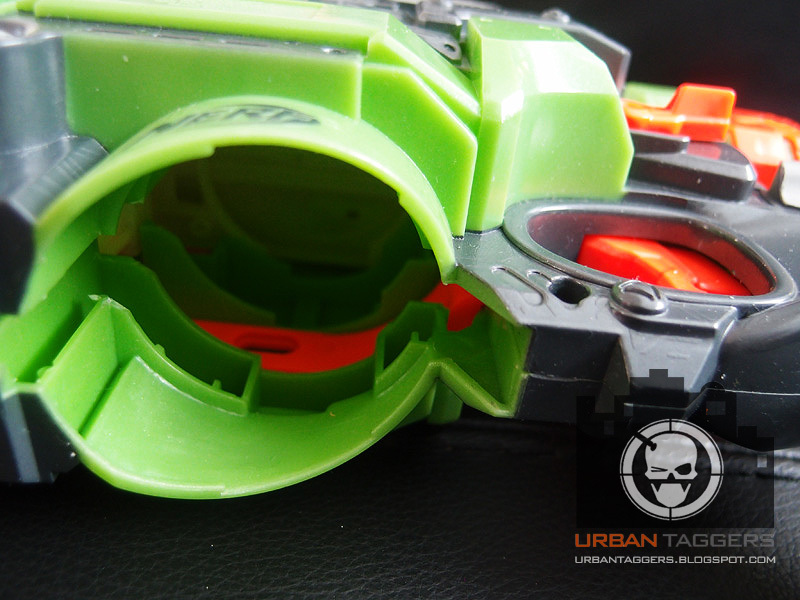 Jerm from Nerf Mods + Reviews did get himself the HVZ 8 Shot blaster we posted about last week. Apparently it's actually not that bad. As always I'm sceptical of whether it'll come to Australia or not, but we'll see:) Check out his review at the link below. 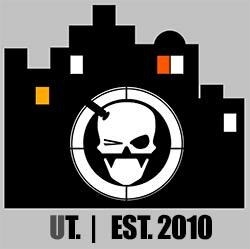 We touched on this last week regarding the custom attachment rig seen on laser tag blog Tactical Tag for the Lazer Tag Phoenix LTX's developed by laser tag affectionatos Custom Tag Dynamics. 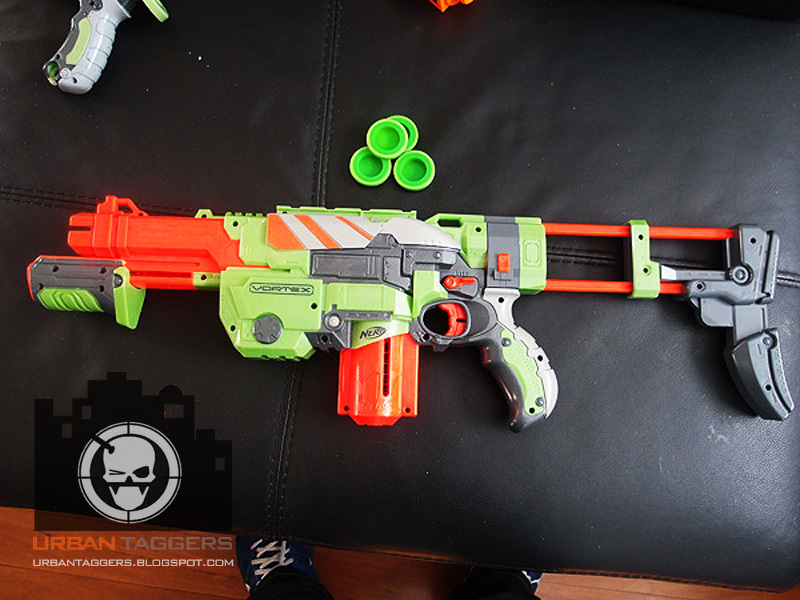 As much as we love it and were very keen to get our hands on some kit, alas the cost to mass produce these is pretty damn exi given they pretty much have to buy full Airsoft rifles first and cull them for parts. If Airsoft was even remotely available in Australia I have no doubt I could commission someone very clever Down Under to do it for us, but alas it ain't. That being said, I don't think it's an issue ordering stocks or sights though, so these kits could very much make it to Australia IF there was enough demand. 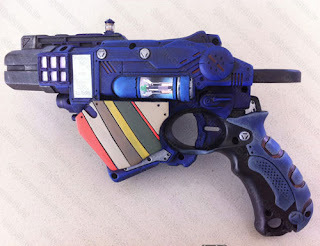 It's SUCH a good idea and definitely gives the Lazer Tag Phoenix LTX blaster a whole new dimension, but one of the biggest issues is the Phoenix LTX was never officially released here, thus meaning any Australian who has a set would have had to have imported them. It's hard enough for Australia to get on manufacturer/distributor's radars let alone for a product that was never actually sold in stores here. New kid on the block "Nerfenstein" has been gaining decent interest due to thia mad Blade Runner inspired Proton aesthetic mod. What I quite like about their work is the different take on design that differs from many others; it's not better or worse, it's just different. For the record the Nerfenstein painter IS a girl (well assuming so from her blog "girliegamer.com.au") which may or may not be the reason for this unique take- not a common thing to see girls in Nerf land, let alone modding. Cool! Dr Who Tardis inspired Proton. Left field right there! 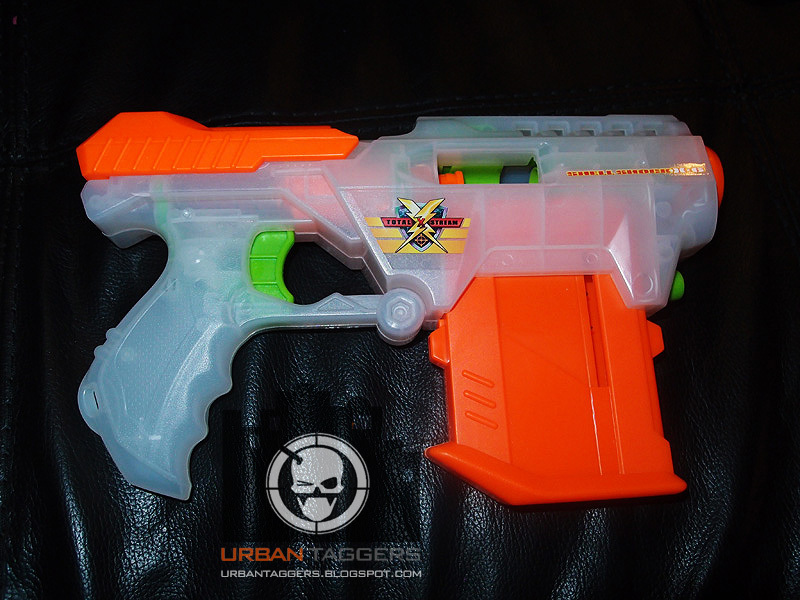 The Lazer Tag Phoenix LTX has always been a huge favourite with us at Urban Taggers however due to their relatively limited release (or non existent release in Australia) there just weren't enough accessories for them; there were hints for future customisation with an accessory rail (similar to tactical rails on Nerf blasters)that unfortunately just went begging. "I find it easier to intergrate MP5 stock, not as cool but you can always add tactical rail on top, and it too opens up a WHOLE LOT of ways to enhance it." Soooo.. Custom Tag Dynamics (CYTDYNE) have come up with this attachment system that allows for a scope and stock to the blaster without requiring any modification to the actual Phoenix LTX unit itself. This is VERY cool; I just hope they become available to buy:) Check out the link below to Tactical Tag to learn more. 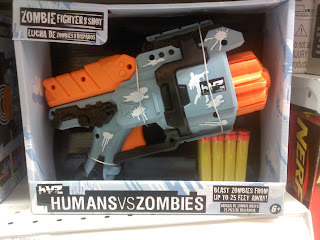 Brought to our attention; check out this Humans VS Zombies "Zombie Fighter 8 shot" branded blaster. While I've seen many a design student project to create a one off packaging/product display for their end of semester project, I'd have to say this is looking pretty damn polished to be one of those:) I don't know anything else about this blaster , so happy to put it to the peeps if anyone can give me more info. 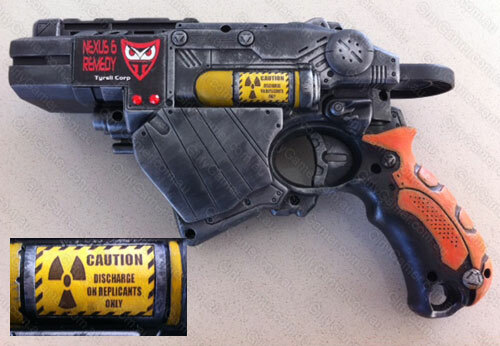 Update- The blaster is genuine and found in US Toys R Us stores, with info found on the HVZ forums. Also check out the blog where I got it from, but it doesn't give us much more intel than what I've provided:) Thanks again Jason and to the others who've given us more intel. Nerf Vortex: Blaster of choice? Praxis, Nitron scope and clip, sans stock. Soo tuff. 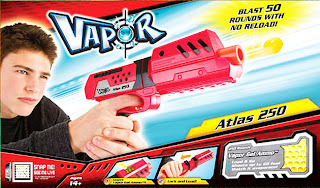 I have no doubt this question is going to be asked many a time over the next few weeks but it's inevitable with new blasters; now that Nerf's Vortex line has been officially released and many of you have already had the opportunity to have a decent play with them, which one is your favourite and why? The Shell Shock X-6 is another one of the Lanard "Clear X" release of blasters that we stumbled across at our local mall; these blasters have been around in the US for some time but it is the first time I have seen them in Australia under the Lanard brand (more often than not Lanard stuff gets rebranded as Air Zone and sold overpriced at Toys R Us). From photos I've always liked the look of these and while I'm really not a fan of blasters with dart holder shells, I still decided to pick one up to see how if it was any good or not.. 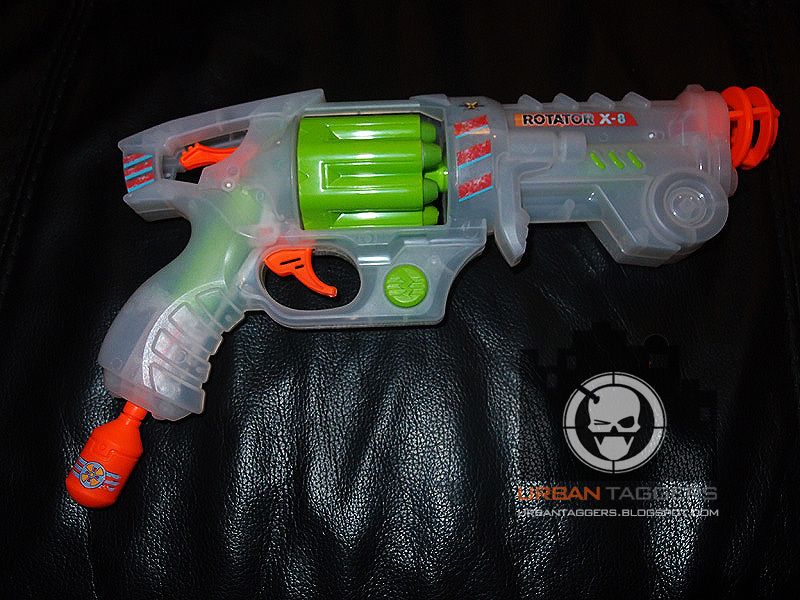 The "Total X-Stream Air" Rotator X-8 is a revolver style blaster from Lanard Toys; it has been available for several months in the US, but it's the first time I've seen them available in Australia, let alone in a new "Clear-X" finish. Lanard don't have the biggest presence in Australia-they normally get rebranded under the Toys R Us exclusive Air Zone banner or occasionally show up at Toyworld's so it was quite the surprise to find them at our biggest department store chain Myer. Looking for a Maverick alternative? Well it's hard to not make comparisons between the Rotator X-8 and the Nerf classic, but is it a genuine rival? 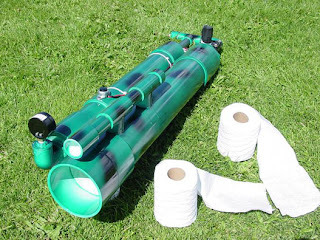 Tactical Tag: Next Lazer Tag System! 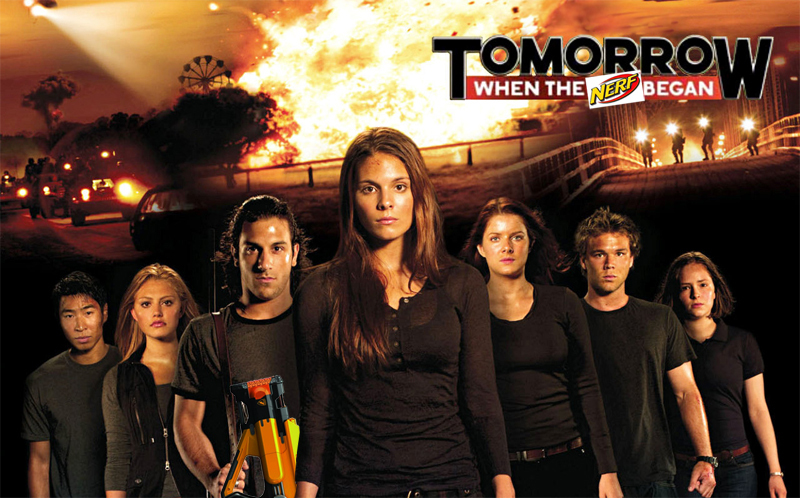 Laser Tag really struggles to make it in the home consumer market, especially in Australia. We were pretty damn pumped for Wow Wee's Light Strike- it's a great attempt at a laser tag system and has lots of very cool features but the big problem is support. Light Strike obviously didn't do as well on the shelves of Australian toy stores as we would have liked (not without trying-as many of you know, we promoted the hell out of it) and I haven't seen stores replenish their stock, leaving just a scattering of blaster attachments and mini targets sitting on the shelves that will probably not sell without blasters to go with them. Ubi Soft's Battle Tag showed promise but pretty much died before it even began and never even made it to Australian shores, leaving laser tag fans not a whole lot to cheer about. "We are constantly developing new models, and while the market hasn't been solid enough to introduce a lot recently, we see it as picking up in the near future. Because of that we have a new model in the works that I think everyone will be amazed at. And it will be fully backwards-compatible with LTTO and LTX, something that is non-negotiable from our standpoint for all models." 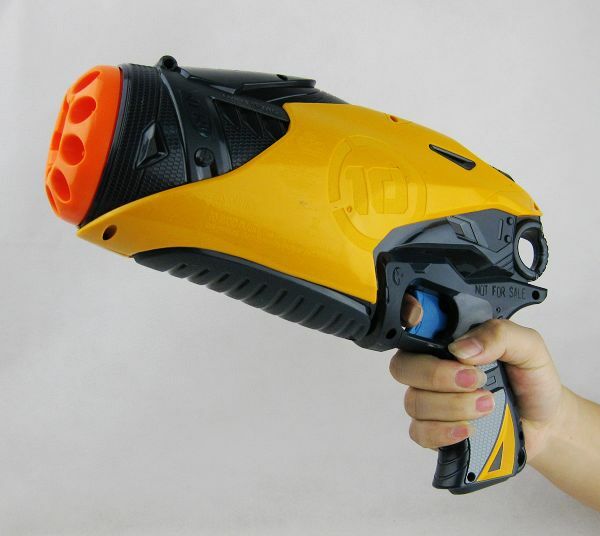 I'm really optimistic about this; we LOVE our Lazer Tag Phoenix LTX's so fingers crossed they actually ship to Australia this time around. Our friends from Foam from Above have gotten their hands on one, so do check their blog out for further info. 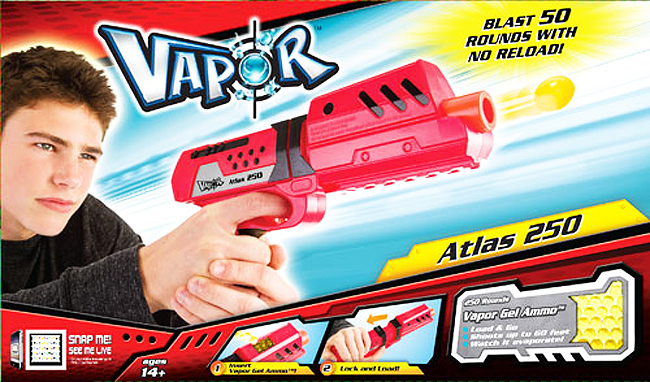 Otherwise check the official Vapor Blaster Facebook page if you're interested. 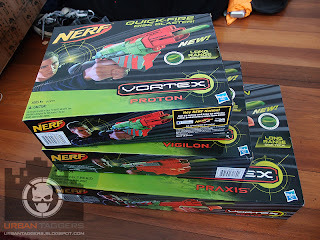 I was pretty impressed on my travels to manage to pick up some Nerf Vortex blasters from Nashville of all places; I mailed it to myself so that I'd not have to cart them around and have them waiting for me when I got home. Ironically, I didn't probably need to do that (and probably got shafted a lil with shipping) as sure enough, the full Vortex range has been popping up all over the shop all over Australia. I've been receiving emails and reports of them appearing in Brisbane, Melbourne, Perth and Canberra- originally rather sporadically but then more and more sightings had me rather sheepish that I just went to such lengths to import 'em from the US! 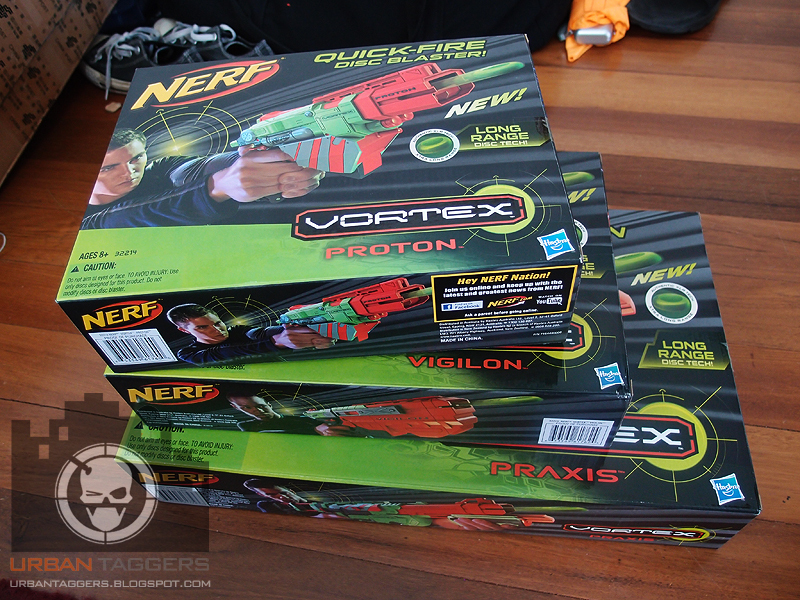 It's quite an amazing time for Nerf in Australia- Sure we missed out on Dart Tag blasters, but to get such a good haul so early in the piece- 9-10-11 or not, no doubt these Vortex blasters are going to be doing Nerf some serious $$$! 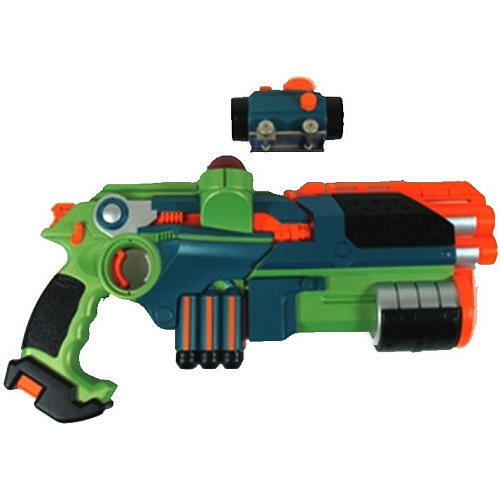 The Dart Zone Quick Fire 12 is a rather novel handheld blaster that utilises a 6 round revolving barrel, much like the Nerf N-Strike Maverick REV-6. What makes it that little bit more interesting is the fact it comes with an additional barrel that can be interchanged (hence the '12' in the blaster's name).